Northmor’s Aly Blunk retrieves a Johnstown hit in her team’s 3-0 win over the Johnnies Tuesday night in the Division III district semifinals. While Northmor’s district semifinal match with Johnstown Tuesday night was evenly-matched, the Knights were still able to take a 3-0 win over the Johnnies. 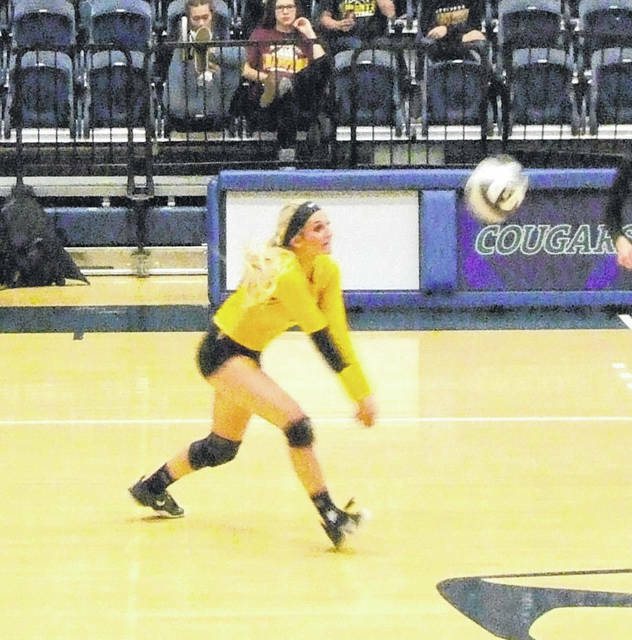 Competing at Mount Vernon Nazarene University’s Ariel Arena in the Division III tournament match, Northmor was able to gut out a 25-21, 25-20, 25-22 win due to being able to gut out points when they needed them. The first set provided the theme to the match, as neither team could truly gain the momentum, leading to a dogfight to reach the 25-point mark first. The Knights opened with two points from Macy Miracle and one from Hanna Bentley to lead 5-1, but a defensive point combined with three scores from Julia Montie tied things at five. Johnstown would lead by as many as three points in the match at 14-11, but went through a lengthy scoring drought where seven consecutive servers came up empty-handed. One point from Bentley and two from Abby Donner gave the Knights a 17-16 lead and they would not trail again in the set. A point by Aly Blunk put them in front 19-17 and, leading 21-19, the team got three points from Miracle to reach game point on their way to the 25-21 win. Wright looked at serving as a big difference in the game. While the Knights only missed two serves in the entire match and were able to give Johnstown troubles with serve reception, their opponents struggled, recording 12 misses on the night. “We felt if we could get the first ball over and get them out of their system, we could trust our defense to come back and swing,” said Wright. In the second game, the Knights rode a fast start by Miracle to take a 4-0 lead. Points by Bentley and Anna Donner and two from Lily Tate boosted them to a 13-5 margin early on. However, the Johnnies would battle back. Trailing 17-8, they would go on a 10-4 run to close within a 21-18 score before Northmor could rally to win 25-20. The third set was another closely-contested battle. Wright was forced to take a timeout with her team trailing 15-13 — a decision that paid off when the team got a defensive stop followed by three points from Anna Donner and two more from Abby Donner to jump in front 20-16. While their opponents got withing a 20-19 margin, the Knights were strong down the stretch, getting one each from Tate and Miracle to claim the hard-fought win. Wright felt her team’s back-row defense deserved a lot of praise for keeping the ball alive throughout the match. In the match, Miracle finished with 23 assists, one kill and five aces. Tate and Anna Donner both had four assists, with Tate adding an ace and 14 digs and Donner contributing 14 kills, 13 digs and a block. Leslie Brubaker finished with 10 kills and a block, Bentley had one kill and one aces and Blunk finished with 18 digs, while Julianne Kincaid added six kills and Abby Donner had 10 digs. Next up for Northmor is Newark Catholic on Saturday. Last year, the Knights took a 3-2 win over that team in the district semifinals. Wright expects another hard-fought match, noting that the Green Wave returns a pair of their top hitters from last year’s team. “We know they’re strong and a high-energy team that plays tough,” she said.